So now it's down to Gov. Deal. Georgia's pardons board rejected a last-ditch clemency plea from death row inmate Troy Davis on Tuesday despite high-profile support from figures including the pope and a former FBI director for the claim that he was wrongly convicted of killing a police officer in 1989. Davis is scheduled to die Wednesday by injection for the killing of off-duty Savannah officer Mark MacPhail, who was slain while rushing to help a homeless man being attacked. 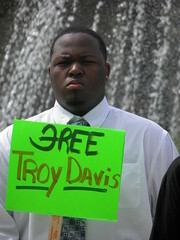 It is the fourth time in four years that Davis' execution has been scheduled by Georgia officials. VSU student Bobbi Anne Hancock asked Gov. Nathan Deal what was going on with the selection process for a new president for Valdosta State University. He went on at some length but I can't quite make out whether he answered the question. South Georgia death penalty opponents took their protest to the governor while he was in Valdosta. Governor Deal was in Valdosta to tour VSU's nursing college but death penalty opponents confronted him about the upcoming execution of cop killer Troy Davis. 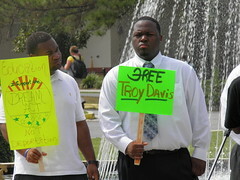 A small group of demonstrators gathered a VSU to plead for clemency for Troy Davis. "We hope he uses his influence to the pardons and parole board to get out get rid of this execution," said Deandre Jones, the president of the VSU's NAACP college chapter. 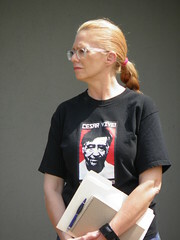 Protesters approached the governor as he left the university center. "The committee has followed the legal process and has gone through the appellate court," said Deal. Davis' execution is set for Wednesday for killing an off duty Savannah police officer in 1989. Possibly the last thing Gov. 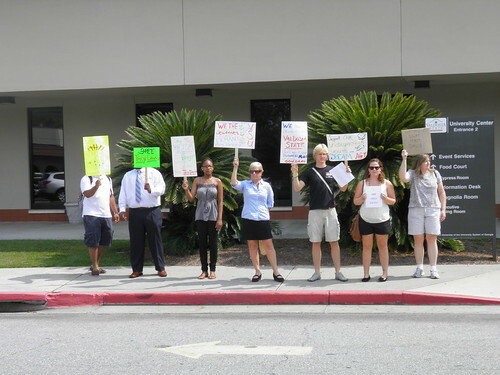 Nathan Deal expected to find at Valdosta State University greeted him: student protesters! Their main question was about the impending Sept. 21st execution of Troy Anthony Davis, about whom Amnesty International says there is too much doubt. 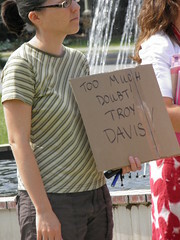 Student protesters greet Governor Nathan Deal at Valdosta State University, 16 Sep 2011. Pictures by Gretchen Quarterman for LAKE, the Lowndes Area Knowledge Exchange.